The Vatican's working year at its end, on Tuesday the Pope leaves Rome for Castel Gandolfo, where he'll remain on summer break until the end of September. 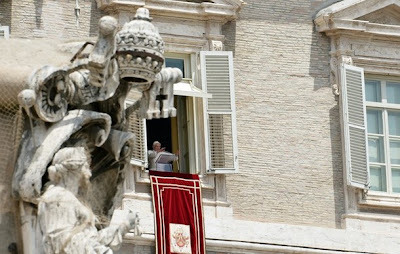 While the traditional exodus of the pontiff and his Curia brings the machinery of the Holy See to a near-halt through July and August, any final moves decided by Benedict over recent days would be announced over the next two weeks. Still expected among the hanging threads is the appointment of a new prefect of the Congregation for the Doctrine of the Faith, with 64 year-old Bishop Gerhard Ludwig Müller of Regensburg -- the editor of the Opera Omnia ("Complete Works") of Joseph Ratzinger -- remaining the anticipated pick for the post. Should the months of chatter pan out, a Müller appointment would prove a watershed, giving Germany two of the Vatican's top three posts. In any event, a new head of the Holy Office would make for the second half of a rather conspicuous passing of the torch in matters doctrinal that began on Wednesday. Returning one of his favorite sons to the building where they worked closely together for three years until Benedict's election, in the Curia's first major batch of year-end moves the Pope named Archbishop Gus DiNoia as vice-president of the Pontifical Commission Ecclesia Dei, effectively making the Bronx-born Dominican the lead full-time player on the pontiff's cherished project of attaining the reconciliation of the Society of St Pius X. A protege of the departing CDF/Ecclesia Dei chief Cardinal William Levada, news of the elegant scholar's Tridentine mission pulled a rare feat for an appointment of the sort as it fully eclipsed the same day's tapping of two other prelates to posts traditionally held by cardinals: the French Archbishop Jean-Louis Bruguès (another Dominican who had been secretary of the Congregation for Catholic Education since 2007) as head of the Vatican Library and Archives, and the Italian Bishop Vincenzo Paglia's placement as president of the Pontifical Council for the Family. While the lesser nod's prominence is testimony to the insatiable lure of the SSPX story both among journalists and the poles of the Catholic conversation -- so much so that the Vatican Press Office released an unheard-of explanatory note on the move -- it's likewise an indicator of Benedict's doubling-down efforts to attain the Society's return. The hope quickly had cold water thrown on it, however, as the head of the Swiss-based group, Bishop Bernard Fellay, said in a Friday homily that the fraternity was "at the point of departure" in the talks "in which we had said we could not accept, we could not sign" a reconciliation accord. For his part, in an interview released earlier today with the National Catholic Register, DiNoia said that while "the Pope is bending over backwards to accommodate" the Society, "he’s not going to give in on the issue of the authenticity of the teaching of Vatican II as a series of acts of the magisterium." Notably, the Preacher-prelate (who gave the homily at Washington's 2010 Red Mass for the Supreme Court) earned his Yale PhD with a dissertation on Catholic theology and interfaith dialogue -- an issue whose post-Conciliar development in the church has loomed as a particular fault-line for the SSPX. 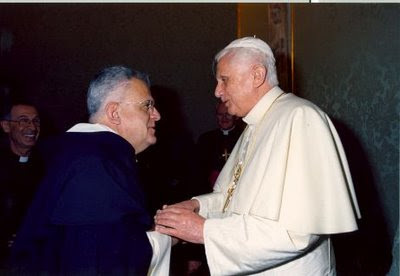 What's more, while the prefect of the CDF doubles as president of Ecclesia Dei, the newly-named American deputy is likely to provide a buffer should Müller be named to succeed Levada, given concerns expressed in some traditionalist circles over the German prelate's decades-old ties to the "father" of liberation theology, the Peruvian Dominican Gustavo Gutierrez. Ordained an archbishop on St Benedict's Day 2009 following his appointment as #2 at the Congregation for Divine Worship and the Discipline of the Sacraments, DiNoia turns 69 next week.